Generally speaking I’m an unashamed carnivore at heart, but when it comes to Indian food I’m more than willing to forsake my love of meat and go 100% vegetarian. Not only is this advisable whilst eating in India, the reality is that Indian food is truly a culinary-nirvana for the non-meat eaters amongst us. Your rogan joshs and butter chickens aside, Indian food is perhaps the most karma-conscious cuisine in the world with a mind-boggling array of vegan and vegetarian dishes to choose from, one is never short of tasty delights from the sub-continent. At any rate, this diversity of dishes make an Indian feast a great option for a dinner party as it allows you to cater for a wide range of tastes and needs, all without compromising the overall success of the meal. Generally speaking, whether the dish be vegan or laden with meat, all Indian food goes well together. I’ve always thought of eggplants and Indian cooking as being the perfect partners. It was almost as if the silky opaque flesh of the eggplant was specifically designed to absorb the rich flavours of Indian cooking and as such could withstand even the boldest of spices. 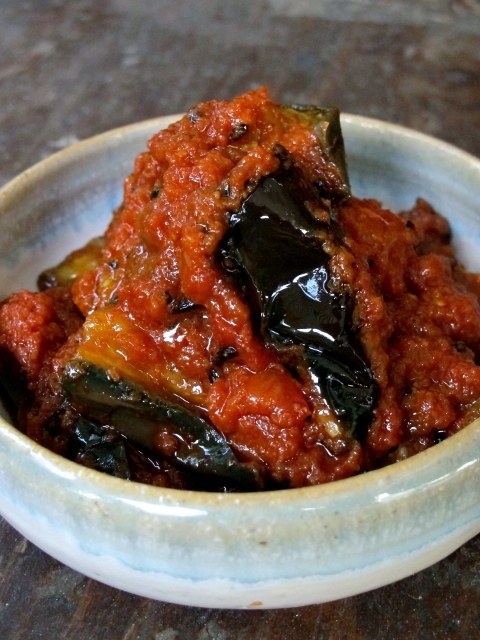 Personally bhartha has always been my favourite way of preparing eggplant and is often a stalwart of any Indian meal of mine, largely for three reasons: it is easy to make, tastes amazing and can be made days in advance. Traditionally the eggplant is deep-fried resulting in a dish that is often swimming in oil and that should come with a health warning. I prefer to steam my eggplant in a microwave instead of frying it which makes for a far healthier and more palatable dish. As with most Indian dishes bhartha can, and should, be made in advance and gently reheated before serving – again highlighting why Indian food makes the perfect dinner party option.